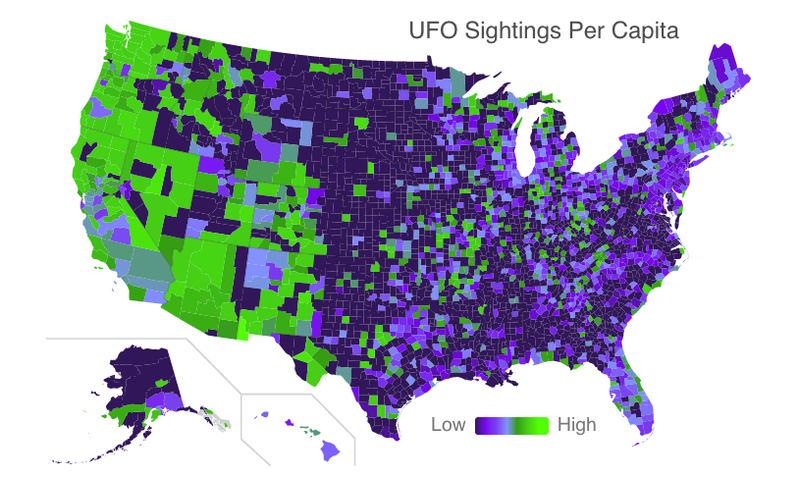 California-based tech firm FindTheBest has compiled a map showing UFO sightings per capita across the United States. Operating on the assumption that absolutely none of these are, in fact, aliens, what does this map actually tell us? As reported in the Huffington Post, the researchers created the map by pulling information from over 61,000 reports, whittling it down to nearly 39,000. After determining latitude and longitude pairs, the folks at FindTheBest were able to determine the number of UFO sightings reported in each county. They then cross-reference that data with the American Community Survey population estimates to build the per capita number. There are two interactive versions of the map, one showing UFO sightings per capita, and one that just shows the sightings hit count. What we learned through our research is that, in fact, most UFO sightings aren't actually reported, and between 98-99 percent of those that are reported can be explained by natural phenomena, whether by shooting stars or even a flock of birds. So we wanted to give more of a per capita [per person] number, which is why we created the per capita statistics. Looking at the map, I'm at a loss to explain why the West has so many sightings. Is it cultural? Are the Western regions more prone to UFO-like natural phenomena? Tell us your thoughts in comments.